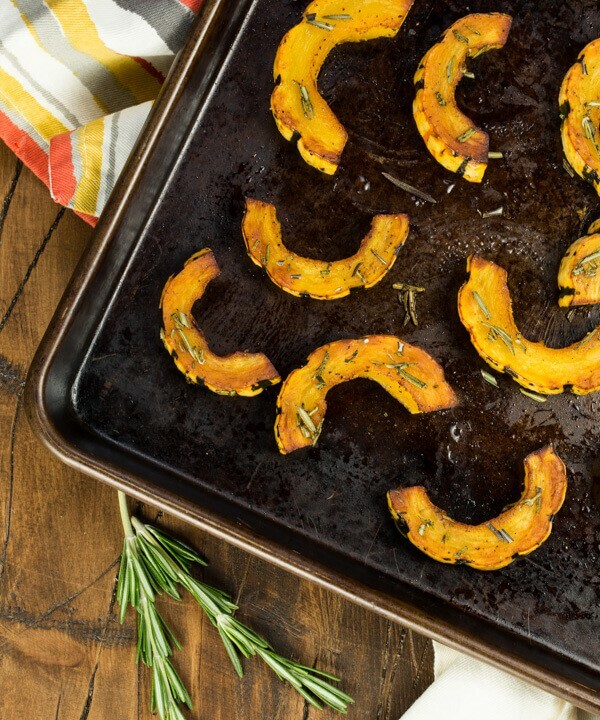 Fall side dishes don’t get much easier than this sweet and savory Rosemary Roasted Delicata Squash. Squash gets a bad reputation sometimes. Not because of taste (it’s SOOO yummy!) but rather for preparation. Cutting through that thick skin and into the hard squash can almost be a life or death experience. (If any of you have every “slipped” with the knife while cutting squash, you know exactly what I mean.) 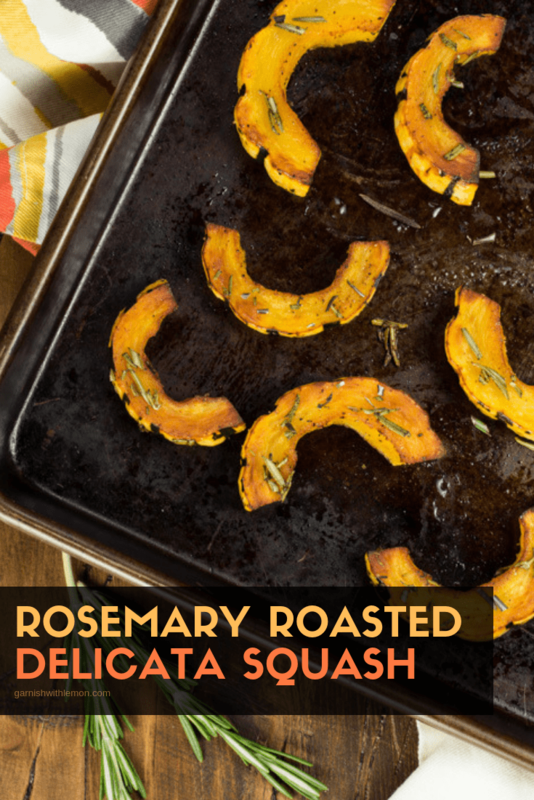 It’s a shame, really, because squash is so versatile, and this Rosemary Roasted Delicata Squash is actually one of the easiest side dishes I’ve made in a while. Tip: Pop your baking sheet in the oven while it preheats. Placing the sliced squash on a sizzling hot pan helps it roast faster and more evenly. 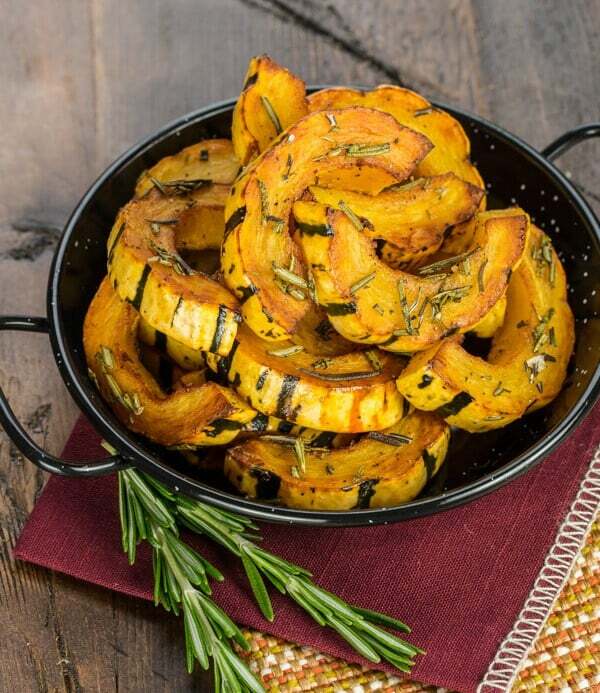 Toss the sliced squash in a little olive oil, season with salt, pepper and fresh rosemary, and you have a savory fall side dish that takes only minutes to prep and just a few moments longer to bake. Plus Delicata Squash are smaller, averaging between a pound to a pound and a half in weight, which is perfect for a family of four or those who don’t enjoy leftovers. Entertaining a large group? Grab a few extra squash. Place baking sheet in oven and preheat to 425 degrees. Gently toss together squash, oil, rosemary, salt and pepper together in a bowl. Place squash pieces on baking sheet and bake for 10 minutes. Flip and bake for another 6-8 minutes or to desired degree of doneness. Season with additional salt and pepper, if desired. Serve immediately.